We’ve teamed up with Jenny, founder of Lunchbox Doctor to bring you a weekly dose of inspiration! Whether you’re trying to kick start a health habit or help your kids try and taste new foods, Lunchbox Doctor has all the answers to all your issues! 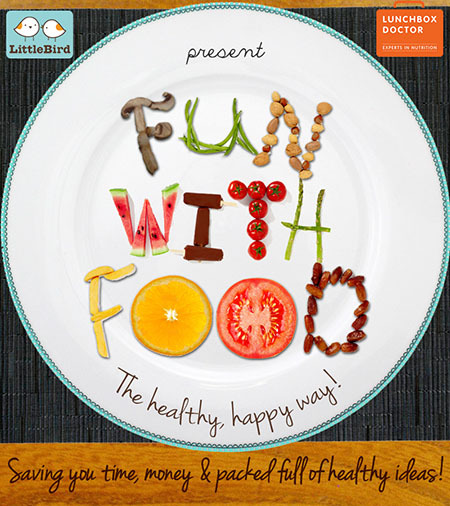 We begin a mission to make food fun! 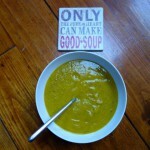 Soup can be a really healthy meal in its own right or a great addition to an evening meal. If you choose the right ingredients it can be a very tasty way to add healthy beans, legumes, wholegrains and vegetables to your diet. Again, depending on the ingredients it is a cost effective way of enjoying a variety of nutrients, including a multitude of vitamins, minerals, anti-oxidants and fibre too. Soup can help you eat more slowly. How often do we read about the benefits of eating more slowly on your digestion and in turn your overall health and wellbeing? When you think about the processes involved in consuming a bowl of soup i.e. smelling, slurping, tasting, and swallowing it’s no wonder it takes us longer to finish than a whole plate of food might. We’re more likely to notice that we are fuller sooner this way and therefore less likely to over- consume. Soup may also help you eat less overall. Studies show that people who eat clear soups or vegetable-based soups (not creamy/fatty soups) as the first course of a meal consume fewer total calories during their meal. and 3 grams of fibre (or more) per serving. Herbs and spices such as black pepper, basil, parsley, oregano, garlic, ginger. Milk of your choice i.e. dairy or non-dairy to add a little creaminess. Frozen or leftover vegetables such as peas, sweetcorn, potatoes, carrots, celery or broccoli. Beans, legumes, pulses, starchy vegetables or grains for added fibre. Try sweet potatoes, potatoes, beans, lentils, brown rice, barley, or wholegrain noodles. This delicious soup is perfect for football lovers. Roasted carrots and buttery leeks – a perfect winter warmer. To finish it off you could dot the top of the soup with small mozzarella balls or pearls pretending they are mini footballs. Have fussy eaters? This soup is the one for you! Noodles are easily mistaken for their better name ‘wriggly worms’. Whilst this might put adults off kids seem to like the idea of eating garden creatures in a meal served to them by a trustworthy adult. Don’t ask me why! 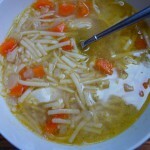 Here’s a soup to make you smile! One way to encourage kids to enjoy soups such as this is to make croutons. Crusts make great croutons. So for a couple of days collect the crusts your child dismisses in a bag or container. Paint them (with a pastry brush) in soft butter or garlic butter and grill until crispy. 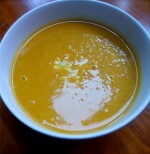 Then chop up and make patterns on the top of the soup, perhaps spelling out an initial in the surface of the soup. Although traditionally Thai food is eaten whilst seated on the floor and using one’s right hand you might like to try a version of this by either sitting at a lower table such as a coffee table to enjoy the soup or all try to eat the soup using a spoon in your right-hand only. Go on, give it a go! There’s a soup for everyone! Thanks again to Jenny at Lunchbox Doctor, tune in next week for some more edible entertainment!